Alex Ross, music critic, on his photograph of Panamint Valley, California. AR Being a cooped-up city dweller, I have a strong yearning for huge, wide-open spaces. I like to rent a car and drive aimlessly, which is how I stumbled upon this place, driving in the California desert. 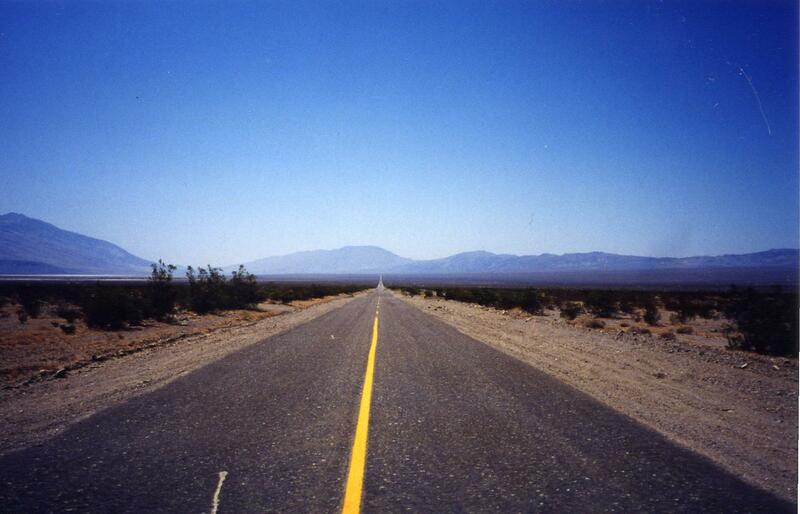 It’s the Trona-Wildrose Road, in Panamint Valley, which is the next valley over from Death Valley. If anything, it’s even more deathly. Death Valley is a national park with stopovers and signage and exhibits, whereas Panamint Valley is just astoundingly empty. I took the photo and developed it and hung it on my wall. A few years later, I made it the desktop picture on my computer, so it’s what I see first thing in the morning and what I look at on and off throughout the day. GB Did you go back to this place specifically for its beauty or did you happen to drive through that area more than once? AR The first time was in 1999: I was driving north from Los Angeles to San Francisco. Ten years later, I drove from LA specifically to see this place again, because the image had become a sort of icon for me. I went to the same spot and stood there. Happily, it was completely unchanged. In one sense, it feels like the clichéd romance of the American open road, but the kitschy stuff has been stripped away. There are no burger stands or gas stations. In the photograph, the composition has a certain abstract beauty, with the deep blue above and the earthy greens and browns on either side and the strip of painted yellow in the middle, but when you’re there, you can’t linger. It’s hot and it’s ominous. The airspace overhead is controlled by the military. Charles Manson had a hideout somewhere in the foothills. To the left is the old ghost town of Ballarat, which is as creepy as it sounds. Many miles to the south is a town called Trona, dominated by a processing facility for sodium bicarbonate; the atmosphere is quite nasty, and that tanginess stays with you all along this stretch of road. Also, the mountains look a lot closer than they are. The range on the left goes up to ten thousand feet. You can understand how in the old days people set off on foot, thinking it was a much shorter distance, and walked and walked, and never got to the other side. GB You’ve chosen this beautiful picture and it has such a dark side. AR Yes, of course that’s part of the appeal—the veiled threat. GB You’re associated with such a difficult, sophisticated art form through writing about 20th century music and yet you’ve chosen this incredibly vast, barren landscape. AR Yes, there’s an extremely dense, constructed, almost artificial side to classical music, but a considerable segment of the modern repertory is devoted to the gradual opening up of space. This goes back many centuries. For example, in Renaissance choral music you have a sense of huge structures unfolding. In the 19th century, Wagner is the great poet of immensity, of the slowly developing process. In fact, the first time I drove through this part of California, I was listening to a recording of Wagner’s Ring. The beginning of Rheingold, with the E-flat-major harmony that stays absolutely fixed as the instrumentation grows ever more lush and opulent—it has this eternal quality, which happens to match very well the experience of driving down endless roads. This picture also makes me think about the search for silence. Since I was a kid, I’ve had an intense fear of noise, which is somewhat ironic because I’m attracted to the noisier end of 20th-century music. I’m always switching rooms in hotels to find the quiet one. GB That must be hard when you live in Manhattan! AR Yes, silence doesn’t exist here. Then again, there’s no such thing as silence anywhere; even in the emptiest spaces, there are always noises. But they are the kind you lean in to hear. The low-level hum of a forest, for example. In Alaska I remember walking over a frozen lake with this constant soft crackle of the ice adjusting itself underfoot. You become attuned to the slightest sound. In the city, you have to tune out most of the sonic information, which is a shame, because you feel more alert and alive when you can use your ears to map a space. GB Do you think that musicians in the 20th century turned against beauty in the same way as artists? AR Well, since Schoenberg, modern composers have been abandoning conventions of musical beauty and seeking harsh new sounds that the average listener might find unappetizing. But over time the significance of even the most extreme musical visions has sunk in. Their influence has been enormous. And ultimately there’s no consensus about musical beauty. What one listener perceives as ugly, another can find deeply beautiful. Yes, everyone will agree that Mozart is beautiful, but not everyone thinks that Mozart is necessary or that he retains significance. In the 20th century, composers wanted to fight the tendency to use music as a means of passive relaxation, like a luxury-spa treatment. If it is truly to be an art form, it must show all sides of life, the darkness as well. GB I guess music requires a certain engagement that you don’t have to give to a work of art. AR With visual art and literature, people can find their way at their own pace. Music has historically been enacted live in front of a crowd, and a mob mentality takes over, as at the premiere of The Rite of Spring. Now, with recordings and the Internet, people can happen upon these pieces separately, and grasp something like Ligeti that they may have struggled with in a concert hall. And twentieth-century music is really so diverse, from the purest, tenderest beauty—the ending of Stravinsky’s Symphony of Psalms—to the most brutal noise. For me, the most exciting works are those in which beauty and ugliness collide, as in Berg’s operas, or in Messiaen, where major triads come up against enormous dissonance. That was part of Messiaen’s spiritual vision, and there’s something very truthful about the collision of extremes that he shows us. Life is like that. AR Beauty in art, or in nature, or in daily life, is what makes us stop. That would be one fundamental definition for me. Driving that day in Panamint Valley, I looked in my rear-view mirror and saw this infinite road behind me and came screeching to a halt. Schopenhauer writes about such experiences in The World as Will and Representation. In our world of striving from day to day, Schopenhauer says, we are sometimes liberated into a different kind of artistic awareness. “The wheel of Ixion stands still.” In Greek mythology, Ixion was bound to a fiery wheel that never stopped spinning. But it goes deeper than a brief respite. Beauty demands a reordering of our priorities: the pleasure of stopping stays with us, and our challenge is to allow ourselves to stop more often. I drove through Death Valley and Panamint Valley this winter. Beforehand I had prepared a playlist of what I thought would make good desert music: Parsifal, Bruckner’s 4th, Messiaen’s Et Expecto… But none of it fitted the landscape just right: too many notes, too rich textures, too opulent, not enough space between musical events. Then I came across Cage’s early piano pieces: In A Landscape, Perpetual Tango etc. Perfect. The music had wide open spaces and each musical event, like each element in the landscape around me, was significant. Rhythm and landscape combined. Thanks for sharing that. I’m going to give the Cage another listen, close my eyes and pretend I’m in California! Andrew, I can’t agree more. I lived in Beijing for a year, and even though the surroundings were the exact opposite of the Californian desert, it was the same silence and emptiness I longed for. Cage’s Early Piano Work (played by Herbert Henk) was the perfect way to create that sense of space.